Buying a car shouldn’t be that complicated. You shop around, you get a quote, and make your purchase. Still, we all know it’s not simple because some dealers will use various deceptive and tiresome tactics to make it seem like their quote is the best when it may not be—including pairing a crazy low price with a bonkers-high interest rate. Some dealerships, especially in competitive markets, will do whatever they can to get an edge on their competition. As I covered in a previous post, some dealers may even pull the destination fee out, only to put it back in after the discount to make it seem like their offer is more aggressive than it really is. Another trick is when a store will offer what looks like a really awesome price, but in order to get that big discount, the buyer has to take an interest rate that is way higher than they would qualify for otherwise. I was recently shopping for a Volkswagen GTI for a customer in the Maryland area, and due to the density of dealers in this part of the country, great deals are certainly possible. But buyers often need to have to be math wizards to make sure they are getting the deal they think they are. If someone was just focusing on the discount, this seems like a pretty great deal. But as always the devil is in the details and this quote has almost everything I warn people about, including crazy accessory charges and the backend destination fee trick. But what I want to focus on here is the caveat that the dealer is mandating that the customer finance this car, 100 percent, at a rate of 5.9 percent. As you can see, the payments on this GTI work out to $527.69 per month—a total loan cost of $37,993.68. This deal works out to $459 per month, or a total loan cost of $33,112.09. 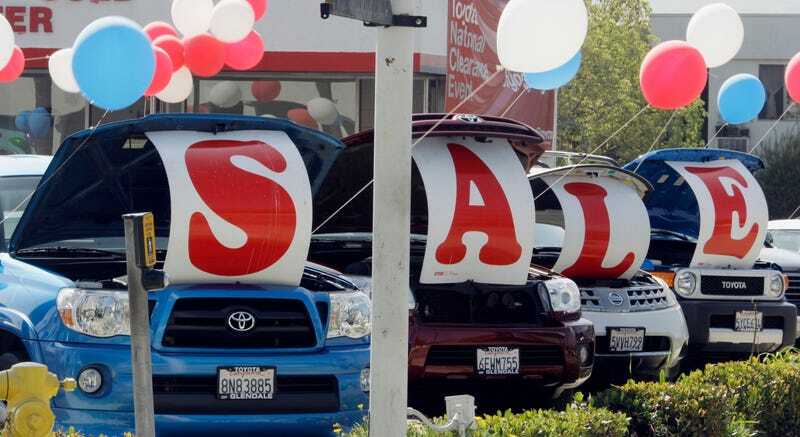 The dealer offered another option to go with lower APR financing at 1.9 percent APR for 72 months, but the customer loses the $1,250 customer cash rebate. In that scenario, the payments work out to about $450 per month and a total loan cost of $32,449.17. So in this case, by taking the smaller discount but the lower interest rate, the buyer spends less on the total loan. Once again, your ability to determine the best deal is based on your skill with a calculator and a willingness to check the math. It’s unfortunate that some dealers have to resort to similar misdirection, but that is why it is crucial to have these quotes in writing and go over the numbers before you walk into the showroom.